No matter what your opinion on the war in Iraq, one thing that shouldn’t be divisive is supporting our troops. And cigar smokers, retailers, and manufacturers have answered the call by sending cigars to soldiers fighting abroad so, at least for a little while, these brave men and women can enjoy one of life’s most versatile luxuries. 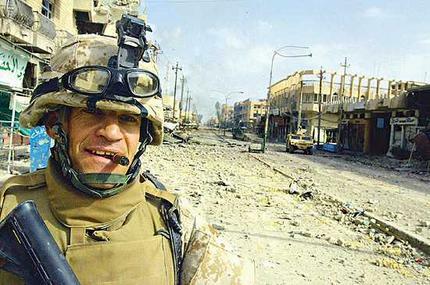 Come to think of it, what other extravagance can be enjoyed just as easily in war-torn Falluja (pictured below) as on the local golf course or in a wood-paneled bar room? With the flight to the Middle East imminent, Picasso Bros., a cigar shop in Lacey, gave about a dozen soldiers assigned to the company’s 2nd Platoon a proper send-off recently. There were decorations and snacks inside, but the soldiers, some accompanied by their spouses, stayed outside to enjoy the warm evening, the light conversation, and a quality cigar or two. “It’s really nice because we haven’t had a chance to relax in quite a while,” said Staff Sgt. Wayne Demetriff, 30. “They’ve kind of accepted me as part of the Picasso Bros. family,” he said. His love of cigars proved addictive. The number of soldiers who smoked cigars grew and some gave up cigarettes for them. In addition to organizing the send-off, store manager Nicole Blocker secured $2,000 worth of cigars for the soldiers. Some were gift-wrapped and distributed at the send-off, and the remainder will be shipped to Iraq. “She called each of the manufacturers, and they were more than happy to send a box or two to these guys,” said store owner Michael Karch, who also owns a store in Centralia. Alexander bought a traveling humidor, which stores cigars at an optimum humidity, to protect them from Iraq’s brutal heat. If you want to send some cigars to the troops, you can find information in any number of places. Most cigar forums have a thread about stogies for the troops, many retailers would probably be interested in sending cigars if asked by a loyal customer, and some online stores like Cigarbid.com have a special section where you can buy products to send to the troops (with the proceeds often also going to support the troops). The site AnySoldier.com also lets you find a soldier deployed in harms way to send a care package to. Also, if there is interest, we would more that willing to help organize and contribute to a shipment from StogieGuys.com readers. Greetings from Mahmudiyah, Iraq. I am on a 11 man MITT (Military Training Team). 6 officers and 5 sergeants who are here for a year, that began with BOG (boots on the ground) in March. We are reponsible for training, evaluating and mentoring our Iraqi counterparts so they can take over and the US forces can finally begin to down size. Unfortunatly we are located with them and share their living conditions. There are 7 of us that smoke cigars and would greatly appreciate it if you find the time and resources to send us a few. Our favorite time of the day is when the sun goes down and temperature drops low enough to enjoy a cigar. We wish to celebrate the end of most days in such a way. Thanks for your time and stay safe. Hi, I'm deployed to Afghanistan and my men and I could really use some cigars if you could arrange it. This is one of the best posts I have seen. I am currently in Afghanistan. I have at least 20 soldiers (including myself) that look forward to a good cigar in the evening. We would greatly appreciate any smokes you are able to resource for us. i was wondering if you still donate cigars for troops and if soo how do i sign up? there are about 10 of us that unwind after our 14+hr day here in afghanistan by getting togather and havin' a cigar togather. it's the only way we can unwind from the hell out here but good cigars are few and far between and we uasually end up with a few people per cigar. if you are able to help out please let me know.